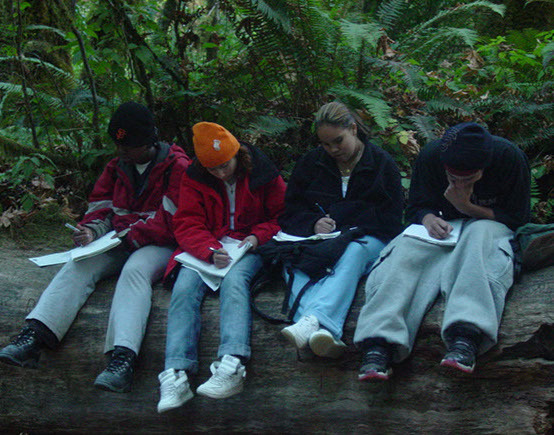 TThe Wilderness Arts And Literacy Collaborative (WALC) is an academic environmental education program at two inner-city high schools in San Francisco, serving primarily low-income youth of color who have historically been underserved. Traditional schooling has been insufficient in helping our students overcome the academic disadvantages that have plagued their educational careers since birth or immigration. A diverse group of teachers developed WALC as an alternative educational program that addresses the needs of our students in a holistic fashion; we offer a model of education that directly addresses students' critical academic needs as well as facilitating their sense of self and sense of place as participants in society and the ecological processes of our planet. Our pedagogical strategies address not only academic achievement, but also personal growth, civic responsibility and environmental stewardship. Place-based field studies that teach core environmental education concepts are at the heart of our academic program. Ongoing habitat restoration projects, the study of natural history, and real, relevant environmental projects that affect systemic change within our own school communities give our students the analytical frameworks and experiential edge to succeed as learners and become positive members of their communities. The students and staff of the Wilderness Arts and Literacy Collaborative would like to thank all of the individuals and foundations who have supported us in the past, and continue to do so as we build our future. WALC would not be possible without your kindness and generosity. Because of you, each year since 1999, one hundred and fifty students at two different high schools have experienced what you see in this website, and five lucky teachers have experienced a wonderful way to teach. Are you a WALC student or graduate with news and information to share with the WALC community? Please feel free to submit announcements, comments, stories and other communications to the Webmaster. We'll get it posted right away!